Actor, writer, comedian, and all-round British treasure Stephen Fry, has expressed an interest in writing for the new Doctor Who. 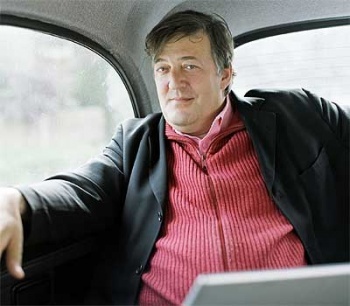 Stephen Fry's contribution to the world of geek are numerous yet subtle; he lent his voice to Fable 2 and LittleBigPlanet as well as appearing in movies like V for Vendetta and The Hitchhiker's Guide to the Galaxy and seminal BBC comedy like Blackadder, and championed Twitter, but if he has his way, that contribution will a lot more direct. Speaking at the British National Television Awards, where he won an award for his recent documentary series Stephen Fry: in America and a 'Special Recognition' award, Fry spoke about how a scheduling conflict meant that he had to pass up an opportunity to write for the show when Russell T Davies was at the helm, but that he would be very interested in writing for the new Doctor, Matt Smith. "The window passed, and I never really got round to it, but I'm very happy to have had the experience of thinking about it... I look forward so much to seeing Matt Smith and I'm sure he's going to be wonderful. If I get time it'll be a thrill, I can't think of anything nicer." Doctor Who is a quintessentially British show, and in the whole world, there are few men who personify the best parts of Britain quite like Stephen Fry and as a long time fan of his work, I'd love to see what he'd do with the good Doctor.